There is a lot to work through I guess, but I'm not opposed to it. The AFL needs to open debate about introducing a red card system, Adelaide forward Josh Jenkins says. He says he's not opposed to the code introducing a send-off rule after watching Port Adelaide lose Robbie Gray to a crude tackle on Sunday. Gray was knocked out in a tackle by Fremantle's Ryan Nyhuis, who has been reported for rough conduct. 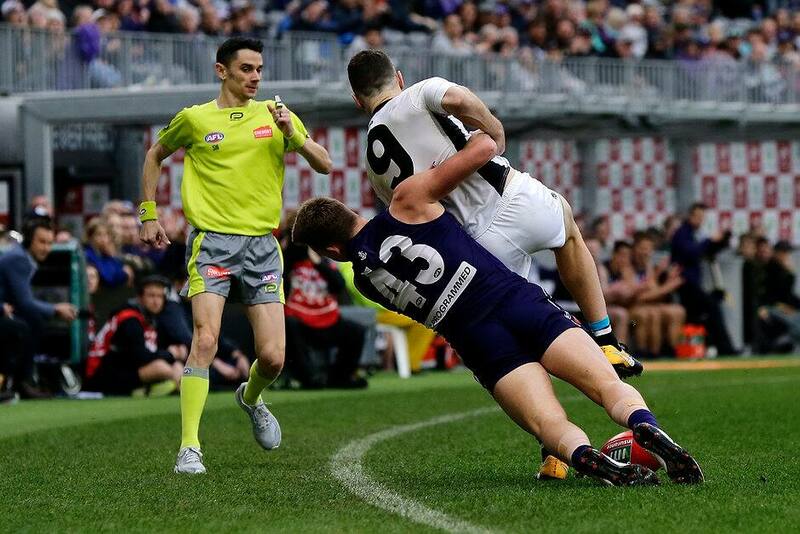 Gray was unable to return to action after being knocked out, leaving Port two players down in their nine-point loss to the Dockers in Perth after ruckman Paddy Ryder suffered a game-ending hip injury. Jenkins says the Power were severely impacted by losing Gray, as were Brisbane when Harris Andrews was knocked out by Greater Western Sydney's Jeremy Cameron in an act which resulted in the Giants forward being banned for five games. "When you see a Harris Andrews or Robbie Gray get their game ended ... it affected Port big-time yesterday," Jenkins told reporters on Monday. "They already had an injury to a key player (Ryder) and irrespective or not whether you consider the player that is injured be one of the best or worst players, you're still down (a player). "I looked at the stats last night, Port only used about 50 rotations ... so it has a big impact. "So it (a red-card system) is something worth talking about. I think it should be discussed." Jenkins suggested a red card for an offender could be tied to the time spent off the ground by the victim. "You could link it up with, you can't come back until that person that is injured comes back," he said. "There is a lot to work through I guess, but I'm not opposed to it."